After 81 years of remaining relatively silent on just what’s in that brown bottle you’re about to down, America’s largest breweries are about to stick nutritional labels on their beers. What took them so long? 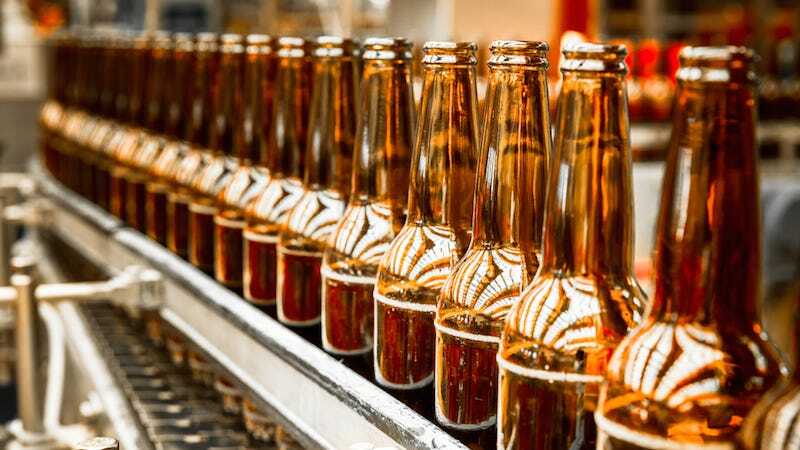 The Beer Institute—yes, that’s the real name—covers brewers like Anheuser-Busch, Coors, Heineken, and more, which collectively make over 80 percent of the beer sold in the US. It just announced that its breweries have agreed to start labeling their beers with a calorie count. In addition, the group has also suggested adding a serving size, an alcohol-per-volume percentage, and tallies for carbs, fat, and protein. You may be wondering, though, why beer didn’t already have a nutritional label stuck on the back. And how did it end up being voluntary when so many other foodstuffs require labels? After all, if the makers of Monster energy drink can’t pick and choose whether to disclose what unholy alliance of ingredients goes into making the neon green potion, why is a brewery allowed to choose? The blame for this regulatory quirk, unsurprisingly, goes back to Prohibition. Immediately after Prohibition’s end, Congress passed a law that gave regulation over alcohol to the Bureau of Alcohol, Tobacco and Firearms (TTB). This 1935 law is why, even today, a bottle of root beer is required to have a nutritional label detailing its calories and ingredients, but a Coors Light isn’t. In the eight decades since, the FDA and TTB have hammered out the distinctions even more. The TTB, for instance, made a pretty badass decision that beer made without hops isn’t really beer at all, and handed authority over it to the FDA. And, when the law requiring calorie counts on menus goes into effect next year, beer served in restaurants will also have to disclose nutritional info. Still, most beer served in the US falls under the TTB’s jurisdiction, and it hasn’t mandated any nutritional labels. This means that when you do start seeing these voluntary labels roll out, they’re going to be a hodgepodge of both style and information. The label might show up on the back of the bottle, but the Beer Institute also noted that it could show up as a link to a website or even QR codes. The information included is also voluntary, so some of the suggested items—particularly the ingredients list—may not make the cut for some brewers. And, of course, almost 20 percent of all beer sold in America isn’t part of the deal, so whether or not those other brands follow suit or simply ignore it remains uncertain. The new labels should roll out by 2020 (although some should be coming out right away). So we’ll soon be able to see for ourselves just what all the different labels look like.